This is a long way of saying we’ve been long-distance fans of Karen for a long time, so we were thrilled when she said yes to a wee interview. Enjoy. How did you come to start Fringe Association? What was the journey that brought you to opening up the shop, and starting the website? I learned to knit in October 2011, when I was living in Berkeley and working the tech world in San Francisco. I was taught by friends while we were visiting Nashville, and thought they were the only people I knew who knitted. So I started the blog, which came to be known as Fringe Association, two months later, and it was a way to keep in touch with them and document this incredible new addiction and hopefully make some knitting friends. I pretty quickly started brainstorming (read: fantasising) about the yarn store of my dreams, which didn’t seem to exist in the real world, and in the course of all that imagining came the idea for the webshop, Fringe Supply Co, which launched as an online pop-up shop for the holidays in 2012. How has your thinking evolved over the last five-plus years you've been in business? In too many ways to begin to articulate! My thinking evolves every single day — about what I’m doing and why, what kind of business I want Fringe to be, what kinds of clothes I want to make for myself. Blogging and owning a small business are both a nonstop growth experience. Do you think people are growing in their understanding of slow fashion, and the need to consider how their clothes are made, and to consider making their own? Are you starting to see evidence of a shift? Absolutely, yes. When I first started knitting, which got me interested in sewing again (not having done so for a few years), there was definitely a conversation happening among a lot of really thoughtful, tuned-in people, but you had to sort of pick up on it and tune in yourself. Maybe it’s just because of the community I’ve embedded myself in, but now I feel like it would be very difficult to be a DIY clothes-maker, on the Internet in any way, and not be exposed to the issues and concerns at hand. And beyond the DIY community, there are so many more brands (or sub-brands) being formed around slow fashion and sustainability, discussions happening in magazines and on public radio, and so on. I get catalogs in my mailbox now from sustainable-fashion companies, and that was not happening even five years ago. I’ve even read articles about the demise of high-street fashion brands wherein the journalist will cite a rise in consumer awareness and demand for transparency as among the many reasons a fast-fashion brand might be struggling. It’s definitely gaining so much traction and being amplified all over the place. What surprises you about your business, and about the kind of responses you get to your work on the website? I remember seeing Kellie Pickler, former American Idol runner-up at the time, guest-hosting on The View one day (several years ago) and when she came out onto the stage and the crowd cheered, she mused out loud, mostly to herself, “Crazy to think people find ya interesting.” And I think of that a lot. It’s pretty amazing to have people show up every day wondering what you’re thinking about or making or selling. I take it really, really seriously, especially with the shop. I never want to sell anyone anything they don’t find beautiful or useful, or that’s disappointing in any way, so I am incredibly choosy and have extremely high standards, because it’s a pretty astonishing thing to have people have that kind of trust in you. Like many of your regular readers, I was riveted by the discussion of gansey sweaters [link: https://fringeassociation.com/2018/04/17/what-i-know-about-gansey-origins-with-deb-gillanders/] on the blog recently - why do you think stories like that strike such a chord with people? I just think we’re all so disconnected from everything — we’ve collectively lost our sense of history and origins, and we outsource everything. We live in a world where we don’t know where our food comes from, how our clothes are made, how to fix anything for ourselves (be it engine trouble or a hole in a sock). When you knit, you’re not only taking back the making of your sweaters or whatever, knowing at least where these things come from, you also kind of can’t help but be aware of the fact that you’re participating in this incredibly long tradition, this thing that has been passed along from one knitter to another for centuries, being improved upon and reimagined all along the way. And then when you find out there’s also this whole other level of history to it — that types of sweaters or mittens or stitch patterns or techniques aren’t random; they come from specific people and places and have evolved or been lost in whatever ways — it just adds a whole extra level of fascination and connection to what you’re doing. A sweater you’ve seen all your life and never thought anything about suddenly has all these layers of history and meaning. 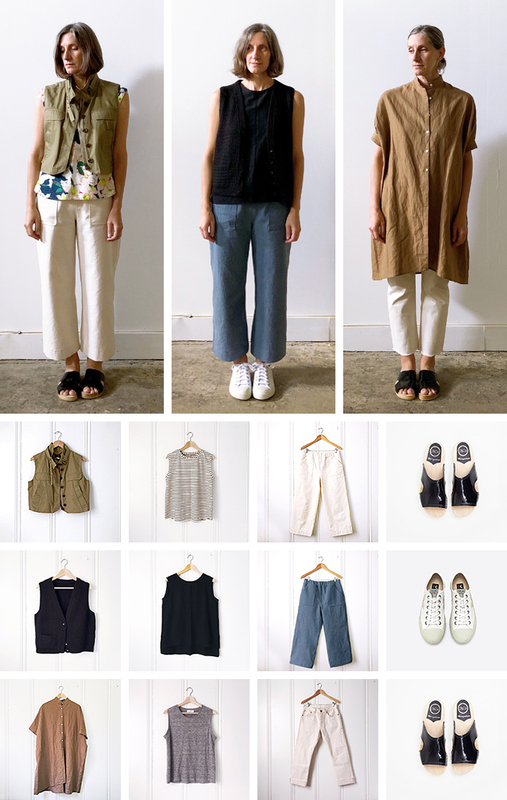 One of Karen's many brilliant tricks is to document her seasonal wardrobes, both as a way to spot gaps that might need filling and to pull together new looks for the months ahead. I’d actually love hear your answer! I enjoy documenting things — whether it’s how I shaped a raglan or how my thinking about my closet was shaped — and I enjoy reading how other people document what they do. I learn from other people’s triumphs and mistakes and points of view, and I hope people can take something away from mine. I don’t always know what I think (or what I think I think) until I’ve written it down and had it challenged by someone else. It’s all part of the growth experience! How do you keep yourself motivated and organised - you have the same 24 hours as all of us, but you do seem to accomplish quite a lot in your days and weeks! Oh, gosh. I have at least two full-time jobs, right?, and the only way I know to do them is to do them — to just keep going! People ask me all the time how I manage to write a blog post every weekday and my answer is that if I didn’t do it every day — like showering and eating and breathing — I wouldn’t be able to do it at all. It just has to be part of my routine. And I know it does seem like I get a lot done, and I do — by necessity — but what I see from where I sit is all of the things that don’t get done every day, because every single to-do list is inherently insurmountable. But that’s just the nature of owning a small business. You have to be willing to show up every day knowing your to-do list is going to beat you, but that you’ll be back again tomorrow giving it your all! I mean, you basically have to be a crazy person — a highly organised crazy person — which I apparently am. What's your absolute favourite garment in your closet? And what are you most looking forward to making next? Generally my favourite thing in my closet is whatever I finished most recently, so right at this moment it is the Elizabeth Suzann half-finished sample-sale jacket I just turned into the best vest imaginable. And what I’m most looking forward to is whatever is in the pipeline that is the most challenging, or makes me the most nervous. For Summer of Basics this year, I think I’m going to make a pair of proper pyjamas — you know, with the piping and everything? Maybe even in a slippery fabric! And I’m pretty nervous and excited about all of that. Thanks, Karen - we really appreciated your generosity and can't wait to see how your #SummerofBasics projects turn out! All photos by Karen Templer. A notebook like Karen's can be invaluable if you're wanting to document, and plan, your wardrobe.